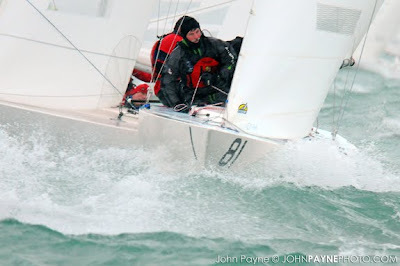 Californian Peter Vessella and his crew, who hold the top spot after the first round of the Etchells Jaguar Series, should feel very comfortable in the San Francisco-like elements forecast this weekend in Miami. As it stands, the weather temps are forecast in the 40s and the breeze both days looks to top out at 17 - 25 knots. Professional sailor and coach Bill Bennett said this morning that he and the crew are "buying more clothes!" And he suggests: "Whatever you own, bring it." Organizer Ken Batzer says the 55 boats signed up for this weekend will see one of the windiest weekends on record for the Jag. With clear skies, chop, and big breeze, the photographers, boatwrights and sailmakers can't wait. It's looking like a gear buster. 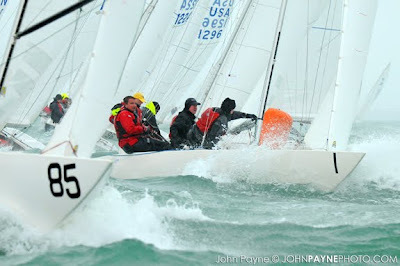 “Ice boating conditions” was what many said after day 1 of racing in the Etchells Jaguar Series in what is usually a balmy Miami Florida. 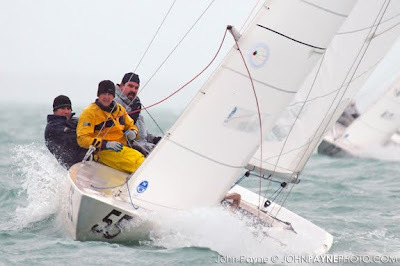 Boston area born, now local sailor Chris Lanza won Race 1 seemingly feeling at home in this cold weather; he rounded the top mark in first and kept his lead downwind in what he described as “a little bit hairy” conditions. The boats were certainly rocking back and forth downwind. 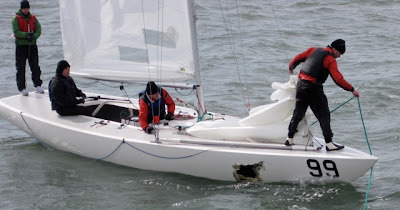 Bill Hardesty, sailing 3-up, won the day with a 5-1-5 and would have been very happy not to sail in the record low temps (39F with gusts to 25) on Sunday morning. In fact, 20 racers decided just that and packed it up on Sunday morning. The other news of the day was a collision near the windward mark in the first race of the day on Sunday, causing one of the largest holes even some of the old salts have ever seen in an Etchells. Fortunately no one was hurt and RC boats were immediately on scene to assist them safely back to shore.